Our 3rd Health and Wellness EXPO is being combined with our 1st Home & Business EXPO to increase attendance and bring all our local businesses together for the community to learn about. 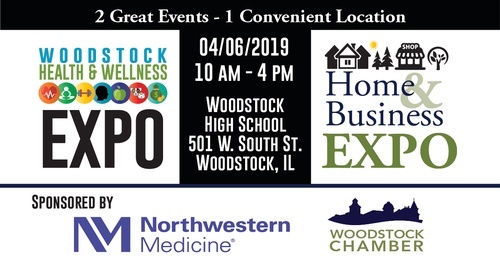 The EXPO will featuring exhibitors from Woodstock and the McHenry County area specializing in all areas of Health & Wellness, Home and Businesses needs for adults, children and pets. Our Health & Wellness event will include total body health, physical fitness, mental health, personal care, pain management, medicine, professional services, spiritual and holistic, and even financial health. Our Home and Office Event will feature businesses focused on personal and home products and services, as well as Business related products and services. Two great events and one convenient location. As a result of this being a larger event, booth prices have been reduced. Please contact the chamber for a new exhibitor price sheet. Amazing raffle and door prizes. Watch for more details in online and print advertising! Exhibitor early bird registration is open. Ends 2/14/19. 2019. Previous Health & Wellness Exhibitors receive a 25% booth discount (does not apply to extras)when registering during early registration. Contact chamber office for more details. Visit website for registration form. Raffle door prizes available throughout the day!